Tehran, 1978 Iran is sliding into revolution. The escalating chaos provides ample opportunities for adventurers. 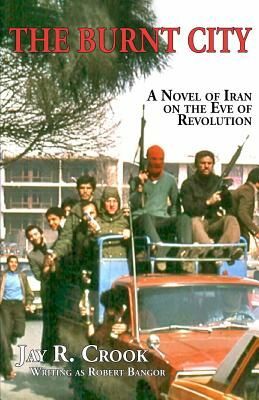 A secret fund that is to be transported to Bahais in southeastern Iran has excited the larcenous instincts of several disparate parties: the Islamic Warriors of Truth, the amoral son of a missionary, a desperate husband, a group of exiled Kurds, and a determined US agent. Events push the reserved but vulnerable Margaret Lexler, trapped in a faux marriage, into the arms of ex-marine Mitchell Ritchie; but is he who he says he is? Now she finds herself in the center of the drama, Ritchie and a young Iranian named Daryush her only shields. Pursued and pursuing from Tehran to Kerman to Bam to the edge of the Empty Desert, one of the most desolate regions on the planet, the opposing parties meet in a bloody showdown at the Burnt City, an eerie geological formation resembling a petrified city, rumored to be a hideout for bandits, smugglers, and demons... Jay R. Crook, a veteran of more than 17 years in Iran and an eye-witness to the Iranian Revolution, provides his readers with a sumptuous banquet of violence, intrigue, greed, and lust in the streets of Tehran and Kerman, a Sufi shrine, the ruins of Bam, the Empty Desert, and the Burnt City itself.